The rural River Thames winds its way across the counties of Wiltshire, Gloucestershire, Oxfordshire, Berkshire, Buckinghamshire, Surrey and through The Chilterns, an Area of Outstanding Natural Beauty. After Teddington it widens and deepens as it becomes the tidal river flowing through the heart of London. From its source in the Cotswolds to the outskirts of London, there are many towns and villages to visit along the river, each with their own character and the landscapes provide a calm and rural backdrop. As it flows through London the nature of the river changes and it becomes the river of trade and where many of the cities architectural monuments and the seat of Parliament can be found. Outside of London, discover the royal River Thames with sophisticated Windsor, home to Windsor Castle, Eton College and LEGOLAND Windsor. Enjoy walks and tours, boat trips, events and excellent dining. Passing through Old Windsor you reach Runnymede Meadows where the Magna Carta was sealed. and a mile further on is the town of Egham. With a pleasant mix of ancient and modern, there's plenty to do in the city of Oxford. Dubbed ‘The City of Dreaming Spires’, the city has been home to royalty and scholars for over 800 years. And Reading is famed for its annual music festival. Henley-on-Thames - home of the famous royal regatta, has so much to offer visitors. A charming Georgian town, with one of the oldest bridge along the Thames, has plenty of ‘not-on-the-high street’ shops. 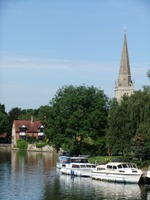 Henley is also home to the River & Rowing Museum and one of the oldest boat operators on the Thames Hobbs of Henley. Marlow - set amongst the rich meadows of the river valley and alongside the woodlands of the Chiltern Hills is a charming Georgian market town . Spend an afternoon wandering its historic streets with an abundance of boutique shops, restaurants, cafes and bistros or stroll down to the suspension bridge which spans the River Thames and joins the counties of Buckinghamshire and Berkshire. As well as the major towns, there are many places where you can relax and enjoy a slower pace too, whether it’s the beautiful countryside around Cricklade, the historic Saxon town of Wallingford, historic market town of Abingdon or Faringdon, with its panoramic views over the Cotswolds. Or stay in Streatley-on-Thames where the river runs through a gap in the Chiltern Hills and the Berkshire Downs and enjoy beautiful views from the top of Streatley Hill.